For WiFiChron, two cascaded modules make an 8-character display functionally similar to HDSP-2534, but bigger and more visible. 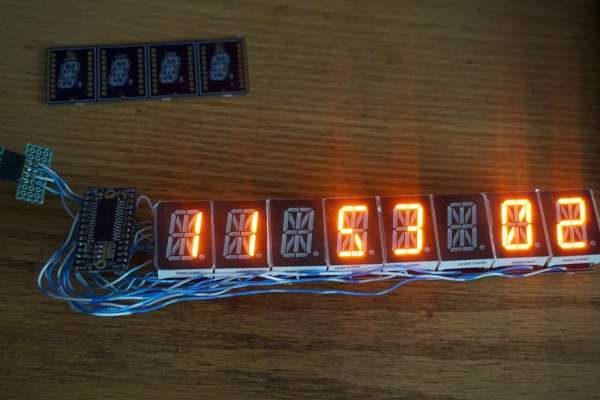 With the “Display Abstraction Layer” already in place, software support should be easy to integrate, since controlling it with the HT16K33 breakout allows the re-use of the above mentioned Adafruit LED backpack library. For maximum compatibility, I followed the same wiring, then connected the two extra segments, A2 and D2, to pin 10 (not connected for the 14-segment backpack) and pin 11 (connected to the DP), respectively. More details on Wise time with Arduino blog. This entry was posted on April 16, 2019 by DP.